One of the most common questions in my classes is, “What are your thoughts on air duct cleaning?” I now have an up-to-date resource to share with students. This month’s Indoor Air Journal has an excellent article on duct cleaning titled, “Is ventilation duct cleaning useful? A review of the scientific evidence.” The author of the article is M.S. Zuraimi from the National Research Council Canada. Debate has always swirled around air duct cleaning. Many professional engineers speak of it being a waste of money. Many air duct cleaners espouse its benefits on occupant health and equipment efficiency. I think the best place to start is to describe how dust and debris build up in the first place. 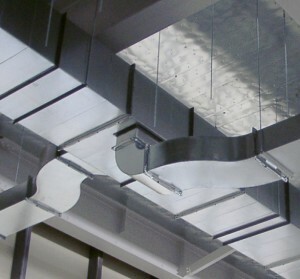 Return ductwork takes air from the space and delivers it back to the air handling unit. Particles from activities such as cooking or photocopying can get deposited in the return ductwork. Filters may be placed on the return grilles to reduce the deposition of particles in the return duct, but the most common location for filtration is directly before the cooling or heating coils. Larger particles or those that accumulate will fall out of the airstream and settle onto the duct surface. Smaller particles are more likely to be filtered out. The smallest particles will likely move through the entire system without be removed at all. The journal article analyzed peer-reviewed literature from 1980 to 2009. After removing a few articles that did not meet pre-set criteria, they were left with 48 articles to review. As with most literature reviews, the findings were a mixed bag of results. Here is the final conclusion of the article, “this scientific review concludes that there is poor evidence that [duct cleaning] can improve or provide good IAQ.” The article found that although duct cleaning was often efficient in removing dust and debris, it wasn’t conclusively effective in improving the IAQ. In fact, some studies showed that disturbing the dust during cleaning resulted in a degradation of indoor air quality. These two resources take differing views on the topic of duct cleaning so I strongly recommend reading both. In the future, I’ll write some more detailed blogs on the topic of air duct cleaning. Write a comment below if you have any opinions on it! Although I haven’t yet reviewed the article you mentioned, I have looked at studies that speak to the benefits of air duct cleaning. One such study, “Effect of heating-ventilation-air conditioning system sanitation on airborne fungal populations in residential environments,” was published in the Annals of Allergy (December 1993). In short, airborne fungal contaminants were reduced by 92% (winter) and 84% (summer). Please note that the protocol used included the use of an antimicrobial product, duct sealing, and the addition of electrostatic filtration, so “cleaning” was simply one part of the process. However, I think it is reasonable to conclude that HVAC cleaning contributed substantially to the results. Another study I find interesting was conducted by the Allergy Consumer Review (http://www.allergyconsumerreview.com/air-purifiers-furnace-filters.html). In this case, these allergy sufferers tried a variety of measures to reduce airborne particulate in their offices, without success. It was only after cleaning their air ducts that they achieved the results they wanted. Lastly, for those who intend to have their HVAC systems cleaned, please take a look at our Web site and check out our videos. I think we can all agree that if you’re having this work done, you want to have it done right…these videos can help buyers become educated on the subject. Interesting article on duct cleaning, it would seem to me that microbial issues related to AHU components(coils, pan, etc…)should included in more detail in this review. The following research is one most often site but did not see if referenced. Is the article freely available on the internet? I would be interested in reading it. I just talked to a UV manufacturer yesterday and learned some things about UV I never knew. Indeed air duct cleaning is useful, anyone with severe allergies can attest to that. Other than providing better indoor air quality it also increases air circulation which in turn help prevent system breakdowns and provides some savings on utility bills. I reviewed the article, which is NOT freely available. Of primary concern, the article focuses ONLY on air ducts, and does NOT consider HVAC system cleaning as a whole. NADCA has long-emphasized the importance of cleaning the entire HVAC system – including the air ducts, coils, blower, and all components. The idea is to reduce contaminants in the air stream. Cleaning only the air ducts might be compared to changing only half of the oil in your car, or vacuuming only half of the floor in your home. If you understand the importance of the activity, you simply would not do that. What I like about the article is that it helps identify the type of research that would be needed to quantify the benefits of the various components of a total HVAC system cleaning project. By listing all of the things the author excluded from consideration, he identified the impact of (for example) cleaning coils, applying antimicrobial products, sealing ductwork, etc. Hi, pretty good post. Air duct cleaning interest me. Thanks for posting this one.